Do you have a KPI methodology? Or do you still treat it as an ad hoc collection of tasks? How’s that working for you? The definition of the word ‘methodology’ varies. Dictionary.com defines it as ‘a system of methods used in a particular area of study or activity’. Wikipedia defines it as a meta concept to that, as ‘the systematic, theoretical analysis of the methods applied to a field of study’. Irrespective, it’s a word that many of us understand to mean a deliberately designed approach to something, to achieve a specific result. We have methodologies because we want to achieve outputs or outcomes as easily and successfully as possible. In the absence of methodology, we are ad hoc, random, even chaotic. And this wastes time and energy, and often fails in achieving the result we want. The result we want from performance measurement is that we achieve our goals sooner and with less effort. A good performance measurement methodology is a system of methods deliberately designed to achieve this. But most organisations don’t have a good methodology, and many don’t have one at all. 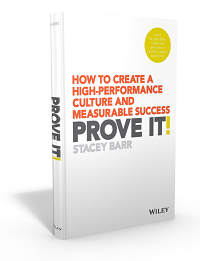 Most approaches to KPIs and performance measures are ad hoc and unproven. But the people who use these methods still don’t have great KPIs or measures that help achieve goals sooner and with less effort. That’s because there is no theoretical basis to these approaches. They’re just common practice. A good methodology for KPIs and performance measures is deliberately designed. A good KPI methodology isn’t ad hoc or made up on the spot. It’s not a single tool or template. It’s not vague and generic. It’s not a software application. And it’s most definitely not a prescribed list of KPIs sorted by function and industry. Comprehensive: collectively, they assist each step or stage in KPI development, from selection, through implementation, to use. Non-prescriptive: they don’t prescribe the KPIs to use, but rather facilitate the user to create the KPIs appropriate to their situation. Necessary: they are chosen and designed to replace poor KPI practices that don’t work and eradicate or ease known struggles or challenges with KPIs. Founded: they have a consistent rationale, philosophy, or set of principles, about what good KPIs are, what purpose they serve, and how they should be used. Proven: they reliably produce KPIs that help achieve goals sooner and with less effort, no matter who uses the methods or in what context they use them. Practical: they can be learned, resourced, and performed as part of the routine work of strategy development, performance monitoring and improvement. Useful: they improve people’s experience of creating and implementing and using KPIs. Transparent: their limitations or weaknesses in producing KPIs are known, openly admitted, and continually improved upon. Is yours a true performance measurement methodology? We use PuMP, and it’s about the only true performance measurement methodology we know of, one that has all of these features. Do you know of others? Which methodology or approach to performance measures and KPIs do you use? Let me know (and I’ll report back an evaluation of all that we collate). Hi Stacey, I don’t know how you do it but each week, your latest blog is exactly about what I’ve been mulling over in that week. I look forward to your compilation of methods other than PuMP as that’s a question I urgently need to investigate. Oly, we must be in sync, somehow! I’ve looked over the preliminary survey results and I think everyone will be surprised what it reveals about the methods other than PuMP. Stay tuned! Hi, I’ve been reading what I’ve receive via this site, and your little intro of your articles but that’s all, anything more I’d have purchase a copy of your book. Are there any free articles, which could help me produce KPIs for my department each year? I’m in the Property Management line and every year, I’ve to crack my mind to think of what KPI I could set for my team mate. . . There is a lot of information I provide for free, here on this blog. Hundreds of articles on different aspects of performance measurement. But for a methodology, a packaged approach with techniques and templates to follow, I don’t provide that for free. That’s how I earn a living. So I’d suggest either buy a copy of Practical Performance Measurement at amazon.com, or search this blog for things you’re looking for.